The need to balance plant lifecycle cost with the total productivity of the plant is one of the biggest challenges faced by the Asset-intensive industries. IFS Enterprise Asset Management (EAM) helps create that the perfect balance in the plant. 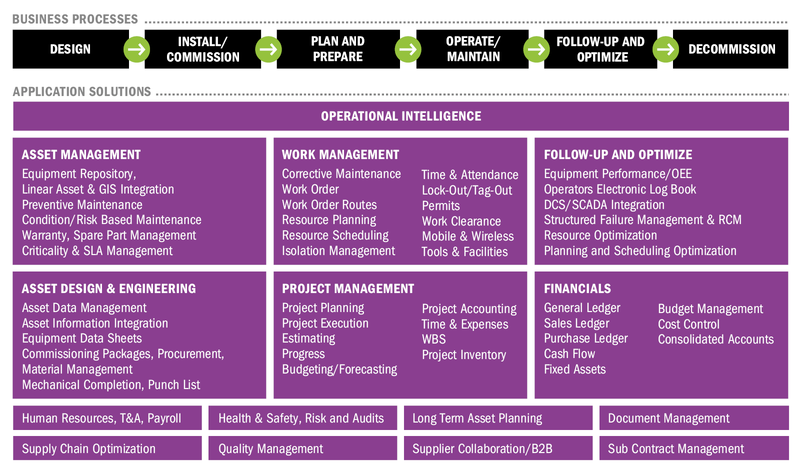 IFS Applications facilitates full Asset Lifecycle Management by offering highly usable tools For Reliability-Centered Maintenance (RCM), Preventive Maintenance, Workforce Management, Capital Project Management, overall Equipment Efficiency and Mobility. Envecon as an IFS global partner offers IFS Enterprise Asset Management solutions that caters to Asset Lifecycle Management along with Risk, Document and Project Management. The solution enables an increase in asset reliability, launch predictive maintenance strategies and reduces maintenance costs. In order to maximize productivity, your facilities and equipment need to be maintained regularly. Our asset integrity management services maintain your assets to ensure productivity, reliability and safety Offers front-office EAM solutions with embedded document management so training , credentialing information and other important documentation of readiness, asset state and capacity are captured. Native mobile apps like mobile work orders and field service management. Enable customers to maximize asset performance, increase equipment up-time and reduce maintenance and operations costs, leading to increased profits and ensuring quality and throughput. Provides solutions for Plant Engineering (early stage costs and asset data) , Document Management (changing asset specifications) , Project Management ( plant shutdowns, refits and lifecycle extensions) ,Contract Management (cost of external engineering, construction and maintenance contractors). Manage preventive and predictive maintenance to ensure that required service work is performed. Track work orders, quickly generate accurate reports, and instantly determine which of their assets required preventive maintenance. This lead to extended asset lifespans, ultimately reduced costs and increased profits. Solutions give technicians the freedom to focus less on paperwork and more on hands-on maintenance. Provides solution that supports maintenance management and asset modification programs, configuration control and operational activities as well as asset structure definition for heavy maintenance. Solutions capabilities are to Prepare Line Maintenance , Manage Maintenance Program , Manager Master Configuration , Operate Asset, Perform Maintenance Engineering ,Scope Maintenance Visit, Handle Fleet Forecasting , ensure maintenance is done at the optimum time. MRO solution with enterprise-wide scope, facilitates from quotation handling, maintenance planning, logistics, maintenance execution, and configuration management to warranty handling, supply chain logistics, cost tracking and invoicing. Offers solutions for Complex Assembly MRO , Component MRO , Heavy Equipment MRO and Line Maintenance. Also take care of workforce management, financials, human resources, document management and business intelligence.